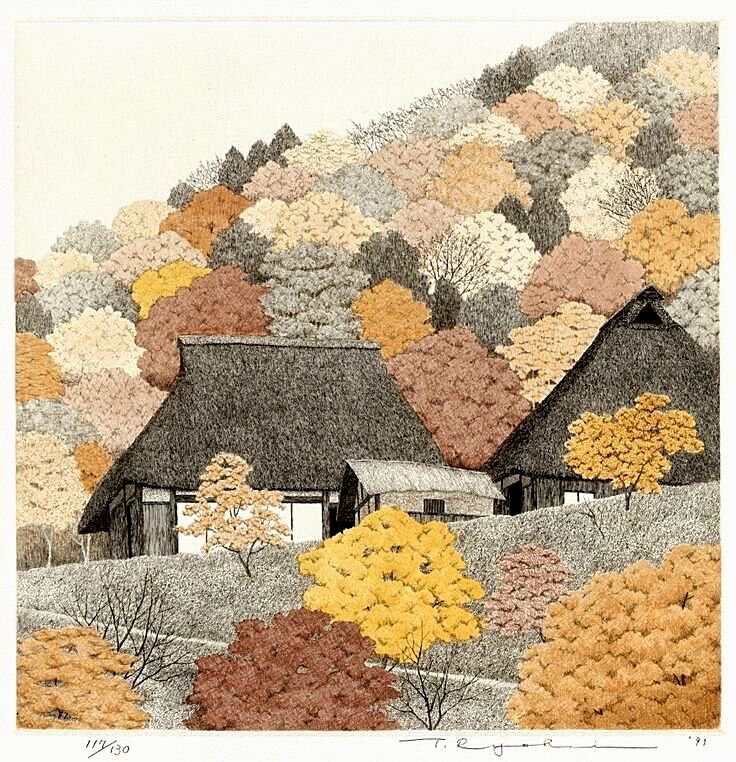 Tanaka has a specialfondness for rural scenes and particularly the thatched roof farmhouses fast disappearing from the Japanese countryside. His careful and meticulous copperplate etchings exhibit a unique talent for creating, usually only with black and white, the different textures of straw, wood, tile and stone. In addition to exquisite detailing, the artist explores the various possibilities for subtlety afforded by the etching medium. Often, Tanaka will employ aquatint to achieve softly textured areas to accompany the fine lines of etching. Occasionally he will use color, most often as a subtle highlight, such as for persimmons hanging on a tree or a kite flying above a farmhouse. Other times the artist will print the image onto a softly colored paper which is then collaged onto the white backing paper, a process known as chine collè. Ryohei Tanaka richly deserves the international accolades received in an artistic career that began in 1963. The artist and his family live in the house where he was born and raised, near Kyoto. The subject matter of his prints is most often drawn from villages in that same Kansai area. In 1995, Tanaka began working on a series of prints showing different locations in Kyoto. For special exhibits held at our gallery, he has also created prints done on thin paper and then scroll-mounted–Anoh Temple, Anoh Temple No. 2, and Snow Village No. 7.